So that's it! Another season of me doing Toni&Guy Hair Meet Wardrobe done and dusted! Now I have to get back to doing my own hair! This year was an absolute blast just like last season and I was so happy to be asked back to do the project. I think since getting my hair cut short again I haven't really experimented much with my hair much since getting it all chopped off at the end of the year. Even so my hair has grown a considerable amount since getting it cut off and I'm due another trim soon! My favourite look from my Toni&Guy Hair Meet Wardrobe Autumn Winter 14 would have to be the Casual one, I know it's super simple but the little bit of texture to the ballerina bun gives the look a little something else that you don't normally get with a topknot. It's like a messy fallen ballerina look and so cute. Below are my show reports of the AW hair looks created by Toni&Guy Hair Meet Wardrobe Global Hair Ambassador Mark Hampton. It was so great to go backstage and get to see what it's like backstage at shows. I've been doing them for a few seasons now and it's always my favourite part of the process. It's really shocking how many people are involved getting models prepped and ready for the runaway. I counted four people doing a ponytail on one girl at Matthew Williamson! The look for Matthew Williamson was a departure from the style Mark normally creates for the models at the MW show. 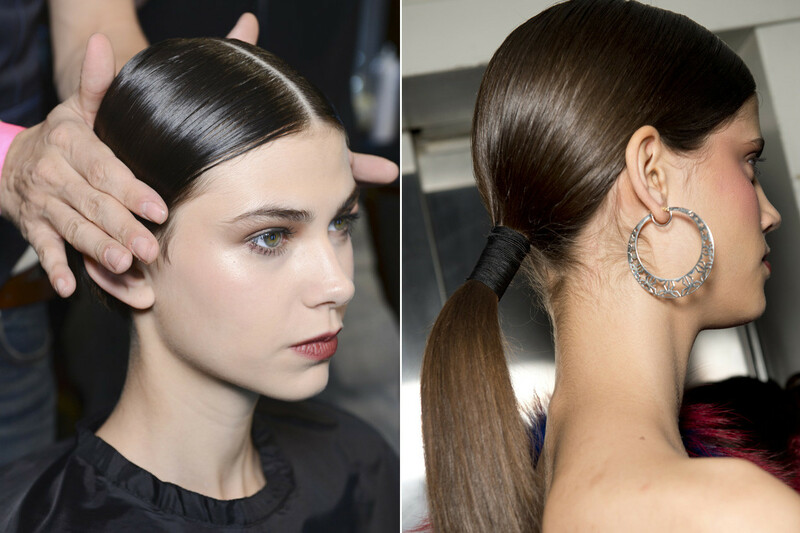 While still uber sleek, glamorous and slick, this year they opted for a high shine low ponytail. It was sophisticated, chic and really glamorous.To get the look the hair was prepped with Toni&Guy Hair Meet Wardrobe Prep Protecting Mist and blow dried in. The hair was parted in the centre and smoothed into a low ponytail. A long length of elastic was used to create a elongated hair tie and give the hair a bit of shape. Then the ends were straightened out even more to keep everything super clean. Toni&Guy Hair Meet Wardrobe Classic Shine Serum was then used to give the hair a high gloss glass finish and create a difference of texture between the ponytail and the rest of the hair. 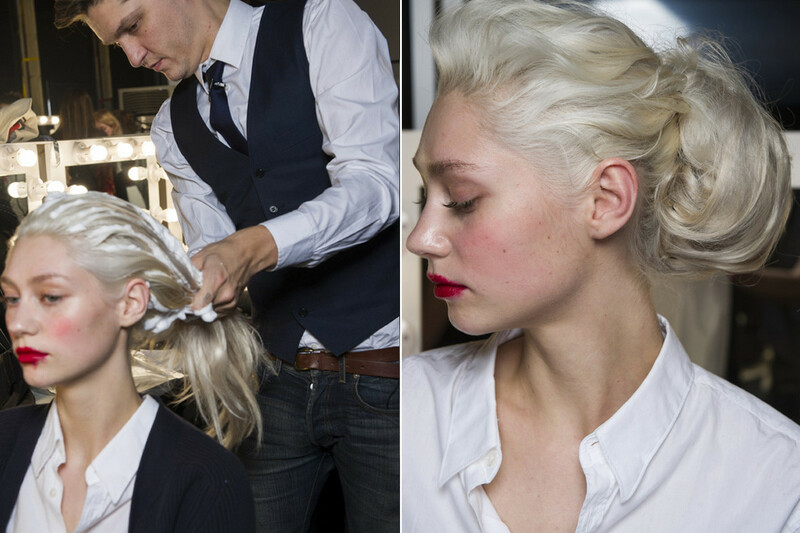 As with all Vivienne Westwood shows, the hair look is vintage with a twist. The look was heavily inspired by British Heritage with an unruly edge. Mark described the look for the show as “Marilyn Monroe come Indiana Jones” Which is different but you can totally see what he means. The hero product for this look was the Toni&Guy Hair Meet Wardrobe Glamour 3d Volumiser. The hair was prepped and then curled with a 1inch tong and pinned to set. The hair was brushed out in random sections and pinned and twisted to create a retro glamorous look. Backstage at Fashion East was the busiest show I’ve ever done. I literally didn’t get a look in edge ways as it was so overwhelmingly packed! At one point I had to stand on a chair to get out the way of a bunch of models trying to get back into the dressing room for the show. It was mental. The look for Ashley Williams show was flat ironed within an inch of your life hair. Very glossy, tamed hair without a kink in sight. 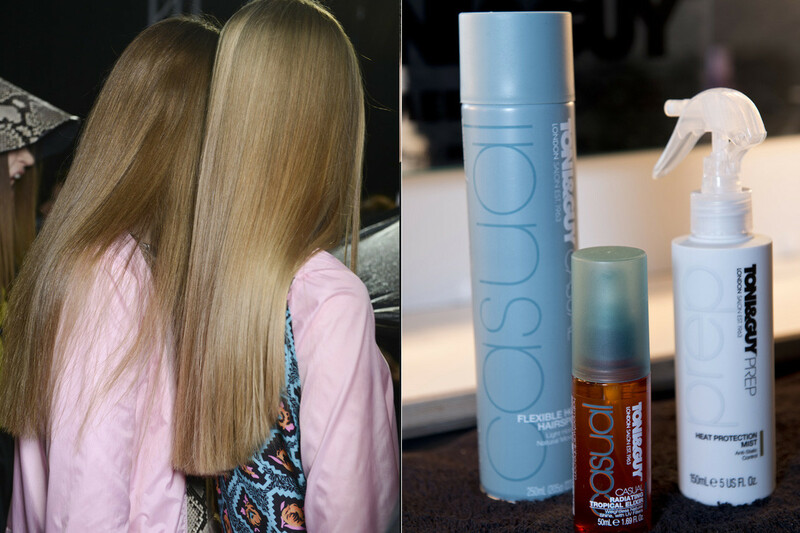 The Toni&Guy Hair Meet Wardrobe Casual Radiating Tropical Elixir was used to tame fly aways, keep the hair looking sleek and glossy. The look for this show was unlike anything I’d ever seen before in my years of doing LFW. 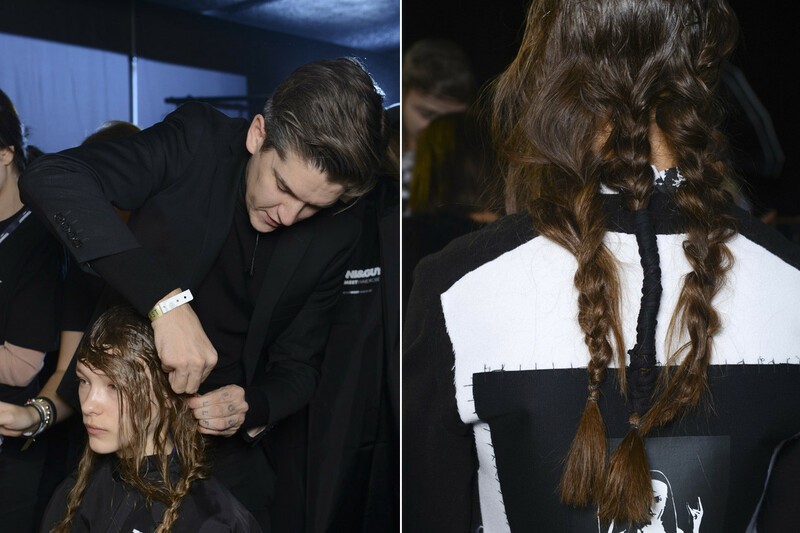 I kept hearing Mark say “this is too neat” pulling out plaits and roughing the hair up over and over again! 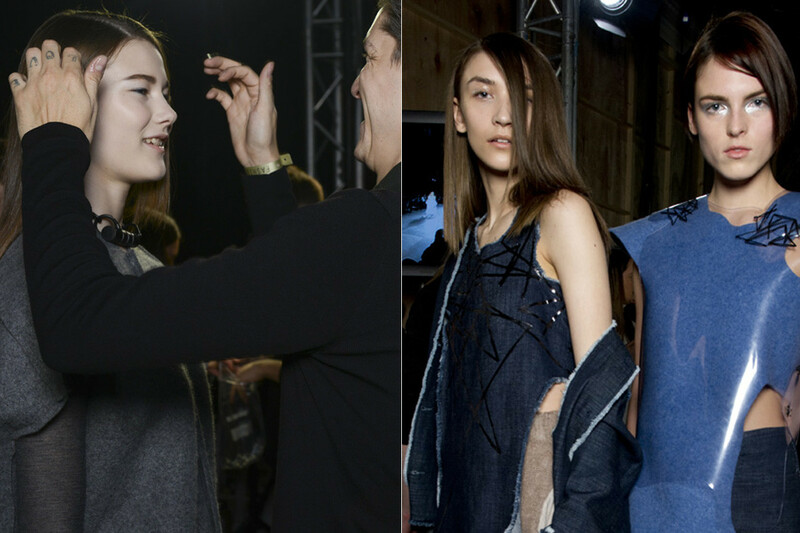 The looks were grungy and lived in and the hair reflected that in a high fashion way. Everything was super slick, textured with and almost wet like look to it. Not the most wearable of all the hair I’d seen, but certain ally very creative and worked perfectly with the outfits. It had really skateboarder, raw vibes to it which I thought was fun, although lets face it matted greasy plaits aren’t every ones thing! The hair for Helen Lawrence was also really smooth and slick with the majority of the models rocking a side parting with hair tucked back behind one ear. I thought the look was really stunning, simple and wearable. 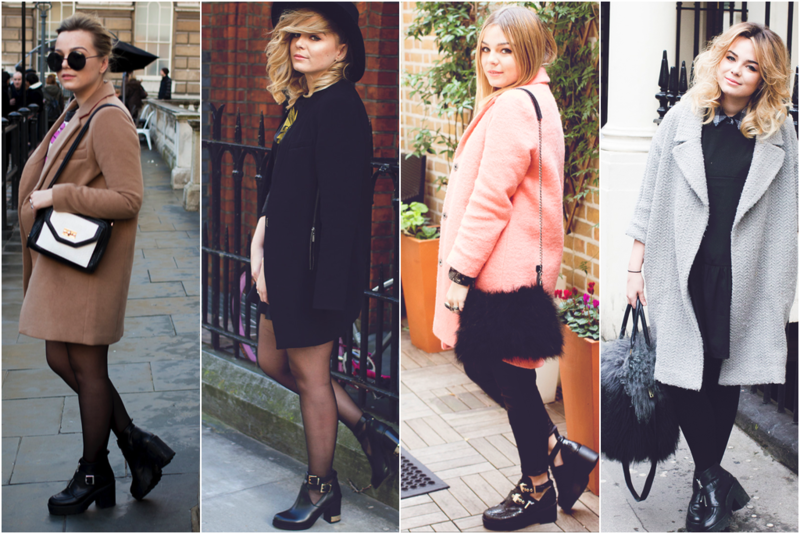 It worked so well with the creatively cut out knitwear.